In a modern company, all departments are important, but two of them stand out as the foremost driver of business development: Sales and Marketing. Owing to the gravity of the roles that these two departments play, they are often observed to be adversarial to each other, protecting territories that they so boldly claim as theirs. One does not have to be an avid fan of Game of Thrones to see a fierce rivalry between the Starks and Lannisters here– the quest for power and recognition happens every day, within the confines of one’s own office. The Sales and Marketing departments have understandably different objectives, motivations and tools. They lay claim to different areas of a company’s operations, and employ their respective expertise to fulfill the roles assigned to them. Though some processes are clearly delineated between them, there are others that are common battlegrounds for these two aggressive competitors. For instance, reporting: When a deal has been closed, how does one decide where to give credit? Lead grading: Who is to say whether a lead is a good fit? Lead nurturing: Who is in charge of harnessing the leads so they can be prepped up to buy? Sales representatives may have a pretty simple way of looking at their role: They always look to close deals. As they close deals, they want more leads to come to them, and this is where a sales executive and a marketing officer may come to lock horns. Sales people almost often complain that Marketing keeps on sending leads that are in fact not ready to close, and that it wastes their time. Sometimes, they also whine about leads that are not fit for the company’s products or services. When it comes to closing a sale, sales representatives almost always protest when the credit is awarded to the Marketing associate that fished for the lead. On the other hand, marketers aim to drive more leads, as this serves as a testament to the effectivity of their campaigns. They, however, almost always complain that Sales people are not putting enough effort to nourish or educate the leads that they send. Oftentimes, they also grumble over the fact that Sales executives always prefer their own leads than the ones they send. Similar to Sales people, they also feel uncontended when the credit is given to the Sales team, as they stand firm that they are the originators of it. Despite the antagonistic relationship, the two departments cannot deny that they mutually need each other, and not coming into terms will ultimately adversely affect the operations of the company they work for. As essential components of a business, the two departments must, in one way or another, find the path towards working together. Industry experts have put forth some strategies that companies may use to encourage cooperation and harmony between Sales and Marketing. The responsibilities of Marketing and Sales should be designed around the customer buying process. The steps in the process should be specifically outlined, and the jurisdiction over each stage should be clearly given to either Sales or Marketing. In order for Sales to meet their targets, they need to be engaging with their most valuable clients. In turn, Marketing can help identify who these customers are, and support Sales as it tries to close the deal. It is best to put the function the employee represents into the background, while bringing to light the activities and purpose of that function. For instance, a company can create customer groups instead of product groups, or split the Marketing and Sales teams into upstream and downstream customer groups that will take care of the various stages of the lead management process. To strengthen the over-all business development strategy, a company should combine what marketers and Sales people know. As both functions will have different customer experiences, it may be unavoidable to develop varying insights. Experts say that these perspectives must be communicated across the two groups, through sharing databases or co-locating Sales and Marketing people. 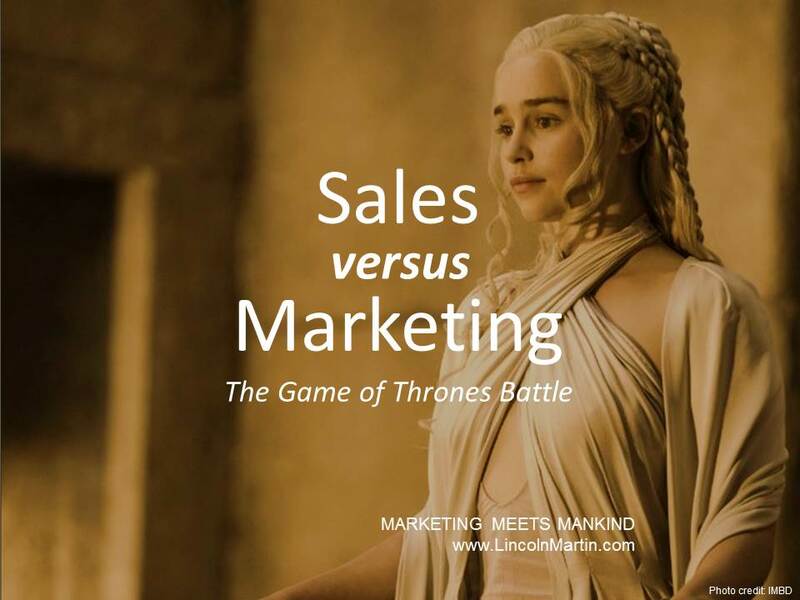 If Marketing is going to assist sales, it will be advantageous for marketers to understand the business from the point of view of the Sales people. In the same way, making Sales people spend time learning the Marketing ropes may also facilitate integration. It may be a good idea to reward both functions for converting leads into actual sales. Not only will it align Marketing’s efforts with Sales’ objectives, it will also ensure that Sales will act on Marketing’s lead generation undertakings. There is, however, a caveat: Not all of one department’s incentives should be tied with another’s performance. The perceived rift between Sales and Marketing may date back from the dawn of the modern corporate structure. Moving beyond the embedded functional stereotypes may be challenging for a great number of companies. Business, however, should realize that getting the two departments to work together not only impacts the company’s bottom line, but also promotes a healthier work atmosphere for every member of the office.